This article is from the December 1908 "Our Hope" magazine. To condense the experiences of half a century into a few paragraphs is almost impossible, but as I consider again life's lessons it is easy to pick out that experience I most value, the one for which above all others I feel profoundly thankful. I wonder, as I think it over, if each of my friends were also to try to set down briefy and honestly what might be called the gem of life's experiences, what they would write. Mine, easily stated, is simply this: An inexpressible thankfulness that my salvation depends upon another's work and not at all upon my own efforts. I am thankful that Jesus Christ brought out my salvation long before I was born, and that all I have to do with it is to accept it heartily and to work out day by day that which God in His grace works in me, to walk in the way He has graciously prepared. I find battles enough in life in bringing my naturally rebellious heart into entire submission to His will, without adding the impossible task of accomplishing my own salvation, too. I said to a friend as we walked home from partaking of the Lord's Supper one morning a few days ago, "How glad I am that my salvation rests in an objective fact outside of myself," and my friend replied, "'Yes, I once thought that it would be humiliating to believe that, but I find it entirely different." In all other religions of the world and in all civilized countries, those who are not true Christians invariably depend upon their good works, charitable deeds and amiable dispositions to save them; in other words, they expect to save themselves. Oh, the wretched uncertainty of such efforts, for who could tell when God was satisfied, or what sinner is in a position to estimate the awfulness, and therefore the penalty attached to a single sin. How th!en could he ever determine what amount of good works would suffice as expiation? No wonder our Gospel is called a Gospel of Peace, for that heart is truly at rest which recognizes Christ as its Saviour. Oh, the misery of restless introspection and retrospection in trying to make up a balance sheet to present before God in urging my claims to live with Him forever. But the blessed comfort of forgetting the things that are behind and stretching towards the mark of the prize of the high calling of God in Christ. How blessed the life of "looking away unto Jesus the author and finisher of our faith." I am not left to lonely fruitless struggles in this life, for He is the Author of my faith; He inspired it; He made. it valid before God, and on that rock first in sovereign grace He set my feet. But more than that He is the finisher of His work in me. Day by day my faith sets her eyes on Him and follows Him even as the eyes of a handmaid follow her mistress. And so it is my privilege to go on from grace to grace, from faith to faith. What a privilege, too, week by week thus to set forth the objective character of my salvation at the Lord's Supper - emblem of His death for sinners. There I reverently go to show forth to the world my faith in His death set forth by the bread and the wine, emblems of His death, His body and His blood separated one from the other. 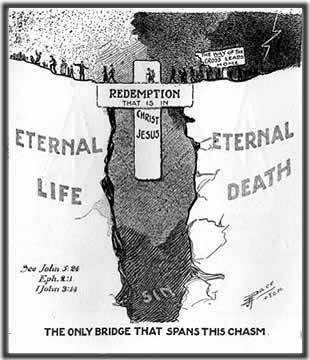 In that objective fact, His death for sinners received in faith by me, I rest my salvation for eternity. I declare to the world every time I go that I believe it, I trust in this and in nothing else. He died for me, the just for the unjust, and I thus simply by faith share in the great blessings God has given to us, blessings which it cost Him infinite Sacrifice, infinite pains to procure. How simple it all is, how wonderful, and how satisfying to him who tests practically the plan of his salvation as so clearly, so unequivocally set forth in God's Word.